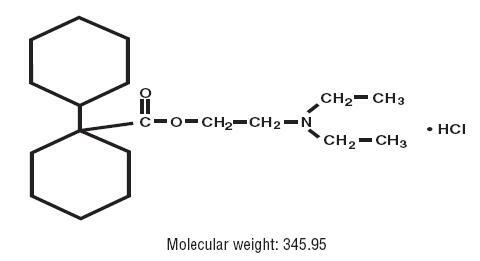 Proprietary Name: Dicyclomine Hydrochloride What is the Proprietary Name? Non-Proprietary Name: Dicyclomine Hydrochloride What is the Non-Proprietary Name? 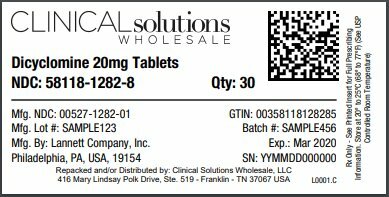 Dicyclomine Hydrochloride with NDC 58118-1282 is a a human prescription drug product labeled by Clinical Solutions Wholesale, Llc. The generic name of Dicyclomine Hydrochloride is dicyclomine hydrochloride. The product's dosage form is tablet and is administered via oral form. FDA Application Number: ANDA040230 What is the FDA Application Number? Dicyclomine hydrochloride is indicated for the treatment of patients with functional bowel/irritable bowel syndrome. The recommended initial dose is 20 mg four times a day.After one week treatment with the initial dose, the dose may be increased to 40 mg four times a day unless side effects limit dosage escalation.If efficacy is not achieved within 2 weeks or side effects require doses below 80 mg per day, the drug should be discontinued.Documented safety data are not available for doses above 80 mg daily for periods longer than 2 weeks. In the presence of high environmental temperature heat prostration can occur with drug use (fever and heat stroke due to decreased sweating). It should also be used cautiously in patients with fever. If symptoms occur, the drug should be discontinued and supportive measures instituted. Because of the inhibitory effect on muscarinic receptors within the autonomic nervous system, caution should be taken in patients with autonomic neuropathy. Central nervous system (CNS) signs and symptoms include confusional state, disorientation, amnesia, hallucinations, dysarthria, ataxia, coma, euphoria, fatigue, insomnia, agitation and mannerisms, and inappropriate affect. Psychosis and delirium have been reported in sensitive individuals (such as elderly patients and/or in patients with mental illness) given anticholinergic drugs. These CNS signs and symptoms usually resolve within 12 to 24 hours after discontinuation of the drug.Dicyclomine hydrochloride may produce drowsiness, dizziness or blurred vision. The patient should be warned not to engage in activities requiring mental alertness, such as operating a motor vehicle or other machinery or performing hazardous work while taking dicyclomine hydrochloride. Dicyclomine hydrochloride should be used with caution in patients with known hepatic and renal impairment.
. They are a consequence of the inhibitory effect on muscarinic receptors within the autonomic nervous system. These effects are dose-related and are usually reversible when treatment is discontinued. MedDRA 13.0 preferred terms) by decreasing order of frequency in a side-by-side comparison with placebo. Table 1: Adverse reactions experienced in controlled clinical trials with decreasing order of frequencyMedDRA Preferred TermDicyclomine Hydrochloride (40 mg four times a day)Placebo %%Dry Mouth335Dizziness405Vision blurred272Nausea146Somnolence91Asthenia71Nervousness62Nine percent (9%) of patients were discontinued from dicyclomine hydrochloride because of one or more of these side effects (compared with 2% in the placebo group). In 41% of the patients with side effects, side effects disappeared or were tolerated at the 160 mg daily dose without reduction. A dose reduction from 160 mg daily to an average daily dose of 90 mg was required in 46% of the patients with side effects who then continued to experience a favorable clinical response; their side effects either disappeared or were tolerated. The following agents may increase certain actions or side effects of anticholinergic drugs including dicyclomine hydrochloride: amantadine, antiarrhythmic agents of Class I (e.g., quinidine), antihistamines, antipsychotic agents (e.g., phenothiazines), benzodiazepines, MAO inhibitors, narcotic analgesics (e.g., meperidine), nitrates and nitrites, sympathomimetic agents, tricyclic antidepressants, and other drugs having anticholinergic activity. Because antacids may interfere with the absorption of anticholinergic agents including dicyclomine hydrochloride, simultaneous use of these drugs should be avoided. Pregnancy Category BAdequate and well-controlled studies have not been conducted with dicyclomine hydrochloride in pregnant women at the recommended doses of 80 to 160 mg/day. However, epidemiologic studies did not show an increased risk of structural malformations among babies born to women who took products containing dicyclomine hydrochloride at doses up to 40 mg/day during the first trimester of pregnancy. Reproduction studies have been performed in rats and rabbits at doses up to 33 times the maximum recommended human dose based on 160 mg/day (3 mg/kg) and have revealed no evidence of harm to the fetus due to dicyclomine. Because animal reproduction studies are not always predictive of human response, this drug should be used during pregnancy only if clearly needed.
. There are published cases reporting that the administration of dicyclomine hydrochloride to infants has been followed by serious respiratory symptoms (dyspnea, shortness of breath, breathlessness, respiratory collapse, apnea and asphyxia), seizures, syncope, pulse rate fluctuations, muscular hypotonia, and coma, and death, however; no causal relationship has been established. Clinical studies of dicyclomine hydrochloride did not include sufficient numbers of subjects aged 65 and over to determine whether they respond differently from younger subjects. Other reported clinical experience has not identified differences in responses between the elderly and younger patients. In general, dose selection for an elderly patient should be cautious, usually starting at the low end of the dosing range in adults, reflecting the greater frequency of decreased hepatic, renal, or cardiac function, and of concomitant disease or other drug therapy.Because elderly patients are more likely to have decreased renal function, care should be taken in dose selection, and it may be useful to monitor renal function. Effects of renal impairment on PK, safety and efficacy of dicyclomine hydrochloride have not been studied. Dicyclomine hydrochloride is known to be substantially excreted by the kidney, and the risk of toxic reactions to this drug may be greater in patients with impaired renal function. Dicyclomine hydrochloride should be administered with caution in patients with renal impairment. Effects of renal impairment on PK, safety and efficacy of dicyclomine hydrochloride have not been studied. Dicyclomine hydrochloride should be administered with caution in patients with hepatic impairment. 50 of the drug is 625 mg/kg in mice. [see Warnings and Precautions (5.1)], the blood concentrations of drug were 200, 220, and 505 ng/mL. It is not known if dicyclomine hydrochloride is dialyzable.Treatment should consist of gastric lavage, emetics, and activated charcoal. Sedatives (e.g., short-acting barbiturates, benzodiazepines) may be used for management of overt signs of excitement. If indicated, an appropriate parenteral cholinergic agent may be used as an antidote. Dicyclomine hydrochloride is an antispasmodic and anticholinergic (antimuscarinic) agent available in the following dosage forms:Dicyclomine Hydrochloride Capsules, USP for oral use contain 10 mg of dicyclomine hydrochloride, USP. In addition, each capsule contains the following inactive ingredients: lactose monohydrate, calcium sulfate, magnesium stearate, gelatin, FD&C Blue No. 1, and FD&C Red No. 3. Dicyclomine Hydrochloride Tablets, USP for oral use contain 20 mg dicyclomine hydrochloride, USP. In addition, each tablet contains the following inactive ingredients: acacia, pregelatinized starch, anhydrous lactose, compressible sugar, dicalcium phosphate, colloidal silicon dioxide, magnesium stearate, stearic acid, and FD & C Blue No.1 Aluminum Lake. A direct effect upon smooth muscle (musculotropic) as evidenced by dicyclomine’s antagonism of bradykinin- and histamine-induced spasms of the isolated guinea pig ileum. Atropine did not affect responses to these two agonists. 2. Tests for mydriatic effects in mice showed that dicyclomine was approximately 1/500 as potent as atropine; antisialagogue tests in rabbits showed dicyclomine to be 1/300 as potent as atropine. Absorption and DistributionIn man, dicyclomine is rapidly absorbed after oral administration, reaching peak values within 60-90 minutes. Mean volume of distribution for a 20 mg oral dose is approximately 3.65 L/kg suggesting extensive distribution in tissues.EliminationThe metabolism of dicyclomine was not studied. The principal route of excretion is via the urine (79.5% of the dose). Excretion also occurs in the feces, but to a lesser extent (8.4%). Mean half-life of plasma elimination in one study was determined to be approximately 1.8 hours when plasma concentrations were measured for 9 hours after a single dose. In subsequent studies, plasma concentrations were followed for up to 24 hours after a single dose, showing a secondary phase of elimination with a somewhat longer half-life.